IN MY DAY, I’VE MADE MY SHARE OF COLLAGES. ALL KINDS OF COLLAGES. Vision boards. Treasure maps. Collages of dreams (the waking kind). And more collages of dreams (the sleeping kind). Even a collage of carefully selected images meant to reflect my purpose in life, the pith of who I am and where I’m going. A way to sleuth out answers. A roadmap, of sorts. YES. COLLAGES FOR SLEUTHING OUT ANSWERS AND CREATING ROADMAPS. If ever there was a through line for the collages I’ve made or the collages I’ve encouraged clients and workshop participants to make, that would be it. And looking back from today’s vantage point, I see how limiting that was. BECAUSE THERE IS ANOTHER KIND OF COLLAGE. Don’t get me wrong, though, at times it’s good (and necessary) to seek answers and create roadmaps. But often, we have a deeper, richer, more meaningful experience when we choose instead to live the questions rather than force the answers, and allow the path to unfold without a roadmap. By doing so we open ourselves up to the stories and mysteries of life; in turn, the answers to what we want and where we’re going begin to flow organically. SO IT WAS WITH GREAT DELIGHT THAT I RECENTLY DISCOVERED AN UNPRETENTIOUS APPROACH TO COLLAGE THAT LETS US DO JUST THAT. Sounds simple, right? But it’s also seriously powerful, if my own experiences and my clients’ experiences with it are any indication. IT BEGINS TO WORK ITS MAGIC IMMEDIATELY. So rarely these days do we stop to take a snapshot of our inner landscape. Yet this collage makes that possible. It provides a window into our depths. And it gently encourages us to embrace it all. The light and dark. The being and becoming. And by bringing together seemingly random images, shapes, forms, lines, and colors, in the end we see that it’s never been truer that the whole is greater than the sum of its parts. As a matter of fact, if we give ourselves over to this idea, a THIS IS ME collage can help us make inner connections we’ve never made before. That certainly happened for me. Afterwards, I started noticing THIS IS ME collages at every turn. I saw objects and images I’d massed together with no particular intent. Yet as I stepped back to view them, all seemed determined to come together to create a whole. To be made visible and acknowledged as deep, soulful parts of me. LIKE THE HAPHAZARD MIX OF FABRICS ON A CHAIR. LIKE THE PLACE WHERE I CORRAL MY EARRINGS AND PINS. 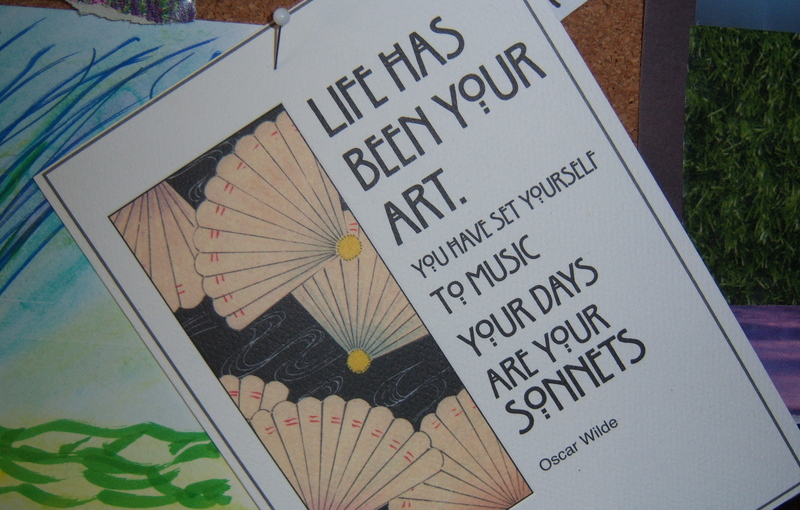 LIKE THE BULLETIN BOARD IN MY OFFICE, WITH ITS EVOLVING MIX OF IMAGES, WORDS, CARDS, OBJECTS, QUOTES, AND PHOTOS. LIKE MY GARDEN, A LIVING, BREATHING COLLAGE. In fact I chuckled a bit as I wondered if perhaps we should call them collage gardens rather than cottage gardens. Then suddenly, in the midst of my chuckle, it occurred to me that we’re all probably surrounded by such naturally occurring collages, and that living life as a collage is a philosophy worth considering. WHOA. A GARDENER OF THE SOUL. I finally got it. All the digging and planting and nurturing and appreciating of the seasons that I’ve done out in my actual garden has merely been a metaphor for who I am at my core. And what I do. I help people dig deep to understand themselves. Plant and nurture new parts of themselves that want space at the table. And appreciate the season of life they’re in. And so when it comes time to leave this garden, as it surely will, I can walk away without much regret, knowing that I’ll always be a gardener, whether or not my hands ever touch the soil again. 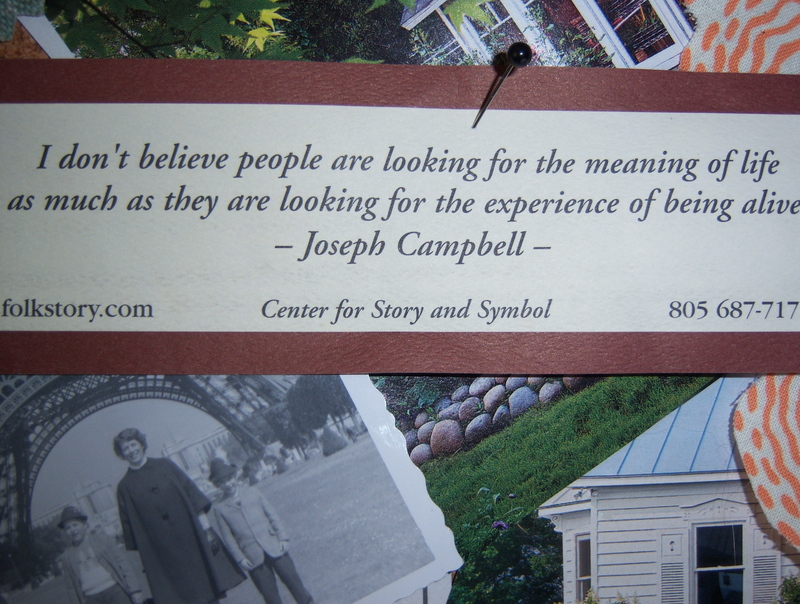 Quite a lovely takeaway from a simple, modest collage, don’t you think? Would you enjoy making a THIS IS ME collage? 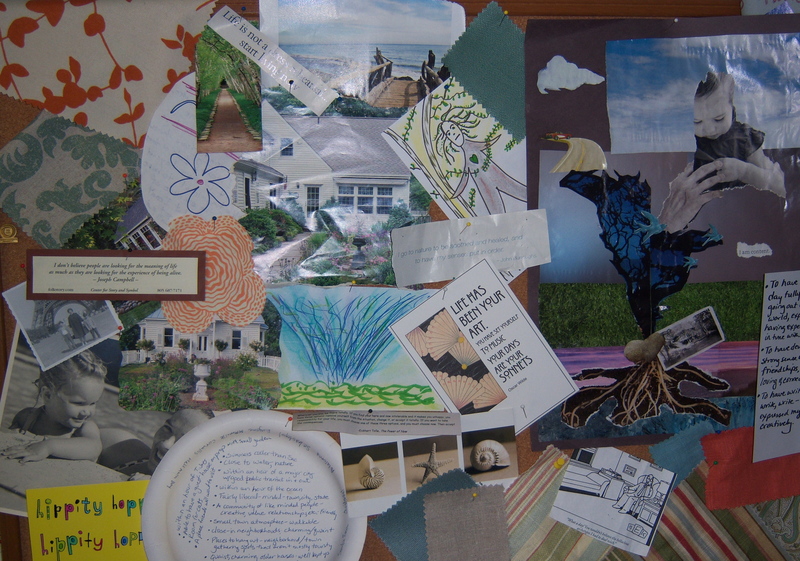 Do you notice any naturally occurring collages that have sprung up around you? 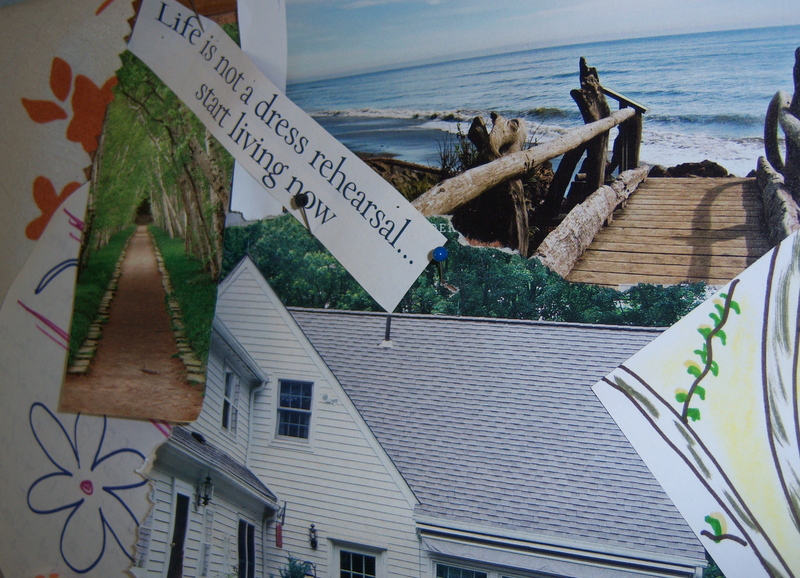 How does the idea of living life as a collage strike you? Beautifully written and thought provoking as usual! I’m reading this after reading the comment you left on my site. “I think a mix of sweet and sour is just about the right way to live my life.” Isn’t a collage a mix of things? A way to blend it together in a way that makes intuitive sense to the creator? Life is erroneously presented as either/or. You’re either successful or your not. You’re either young or old. You’re either good or bad. Yet, all of us know that’s not true – we’re all a mix, a living, breathing hodgepodge that needs to be revealed. Am really into your “this is me” collages around the home. 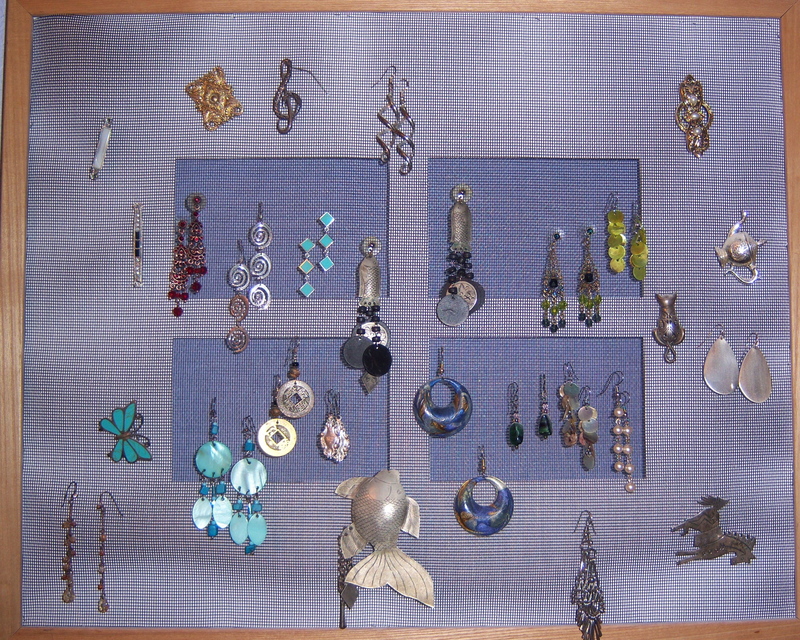 I also have tons of earrings – big, small, wild, subdued. All my collages are wild and free. I’ve always been “messy” and took a lot of heat for it. Why does mess freak folks out? p.s. I love “gardener of the soul” for a job title. It feels real and very you. Use it! Thanks, G. Absolutely, collage is a mix of things. And I like that you brought up messiness. Because collage, like life, is a bit of a mess. But that’s a huge part of its beauty. And just like life, insight often flows from mess, especially when we step back and look at it as a whole. That’s a nice thought for today! I loved this! I think a lot about my life as a collage as of lately. Sometimes when I look at my own blog I cannot help but smile because it is a collage and patchwork of all the things that I love and adore. Writing, inspiration, photos and creativity all infused into one. Hi Hannah Katy – Welcome, and thanks for the visit. That’s enticing, what you say about your blog as a collage. As soon as I get a minute, I’m going to pop over to check it out! I haven’t done a project like this in ages – and I mean ages. 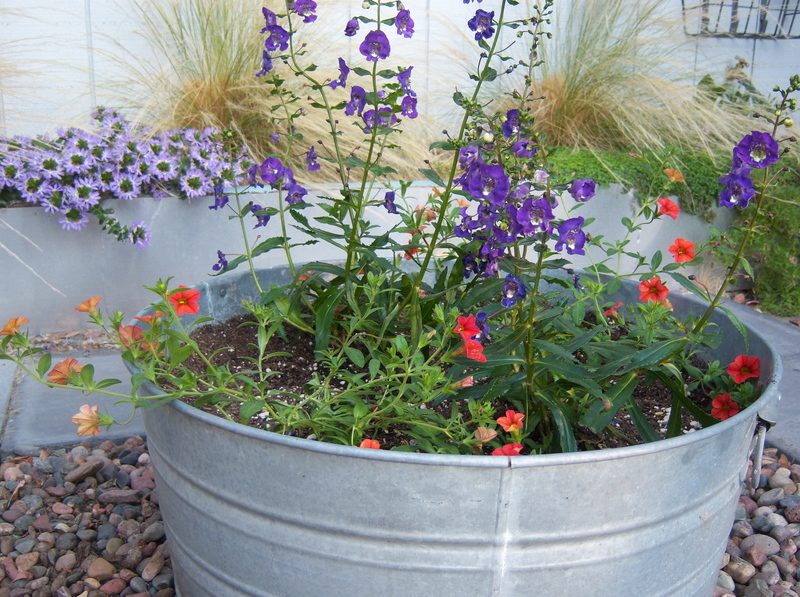 I keep thinking I want to do something like this and yet the materials are not readily available so I just don’t. It seems that everything focuses on cutting from media – and magazines etc are fairly absent from my house. But I love the idea. I am sure that the way we group things or display things can tell us a lot about ourselves if we know how to look. But then again, maybe not as my boards etc reflect only that I am a mom!! I think I am going to make time to create and consider. Hi M – Yeah, it’s a little easier for me, since I keep a collection of magazines just for this kind of thing. Images are so powerful, even if we’re not doing collage with them. And in my work with clients I pre-pull images and have them sorted into categories. It’s so great to be able to present a stack of images to someone and just let them go with it. So if you were here, I would invite you over and you could just lose yourself in them! You are AMAZING!! I love this post. You would not believe how much I relate to it. I tend to see the world around me in a collage form, every shifting collage form, like a kaleidoscope. Everything is a collage, and I LOVE that, because I am forever fascinated by the shapes, colors and textures. It is what draws me to photography. I also see my own emotions as a collage, as opposed to seeing them as linear or sequential. When I process feelings or even respond to the world, it is very much like your emotional collage poetry here. It is often hard for other people because they want to order my emotions (or even beliefs and thoughts) in a structured sequential way. And they often think I can’t possibly reach conclusions or resolutions by letting myself have it all, all the feelings at once, none judged as good or bad, right or wrong. They just ARE. And from this place I see so many things, feel so many things, and become so many things. Unbounded and unafraid. That is what I love about a collage, although I tend to be a fairly orderly person, I love disarray and letting go, and contradiction and so forth. Living much in the wild, I came to learn that Nature is a perpetually changing collage, and yet is very orderly at the same time. I LOVE THAT!!! Hi Robin – I love what you say about the collage of your emotions. That’s such a great way to put it. And you know, I think a lot of people experience that but think there’s something wrong with it, because others try to get them to be linear, to “make sense” (which is much more of a cognitive function, anyway). So it’s tremendously normalizing to say emotions are like collage, scattered and messy, yet always with an overarching order. It’s the paradox of life, isn’t it? And so true that we need only look to nature to understand it better. Thanks so much for the visit, and hugs right back to you. I love how you describe Gardener of the Soul. It’s so much more relatable, for me at least, than the more conventional titles we’ve come to accept. I don’t recall ever making a collage myself, but it seems I leave behind a collage-like evidence in my path. 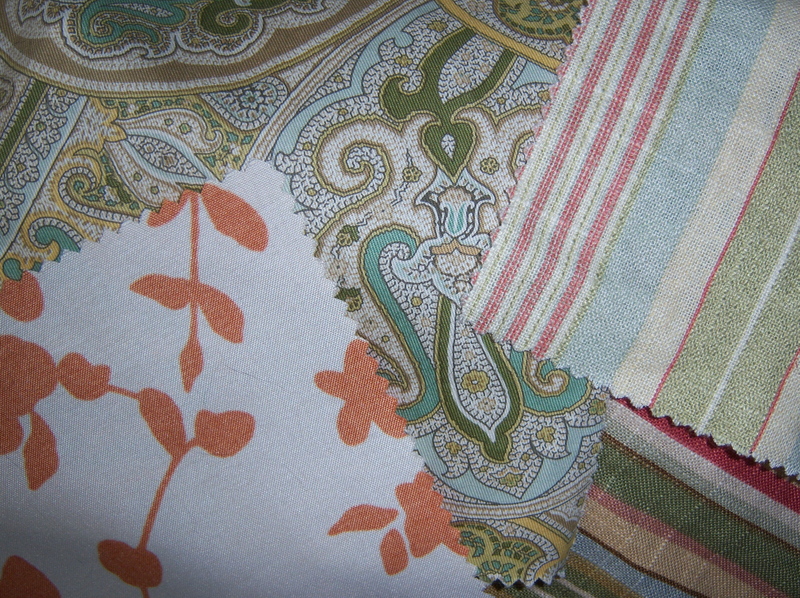 Swatches of fabrics from my sewing days. Various paints/colors from my painting days. Crystal, wooden or metal beads from my jewelry-making days. It sounds like a big ol’ mess, but I don’t mind. Life is messy if we’re truly living. Hi Belinda – Yes, mess seems to be the theme emerging here in the comments. I love that. I imagine you making beautiful messes with your sewing, painting, jewelry-making. And taking great joy in every bit of it. Thanks! I love this exercise and how it turned out. These things are always powerful and I chuckled with you at the cottage garden things. I just had the idea of doing collages of my life in decades. I’m wondering if that would be insightful or scary. I also may need an entire wall! Oh, Tess, that would be so incredible. Do it, yes! I have to tell you what my husband gave me last year on my birthday. He does graphic facilitation, a form of facilitation that includes colorful drawings, and he used those techniques to draw every decade of my life so far, based on what he knows of me. He presented one to me each day during the week of my birthday. I was speechless. The fact that he did it was one thing, just so touching, but seeing my life unfold like that was like nothing I’ve ever experienced. Timelines are powerful, and a collage timeline would be the deepest of inner work. Life is my collage and the canvas I paint on. I never made collages or vision boards though. My eyes roam like yours and I see vision boards minute by minute. My eyes pick up on what is my world today and tomorrow there is another one in the making. I see an object and it takes me back to my childhood, I smell a smell and it takes me to a holiday long gone, I see a garden image and it takes me into the future, I see a mandarin and it takes me into the now and my hunger for it. All that if I let those images in and be present. When I am not present I miss it all and lose that art of living. I haven’t created a collage since elementary school. I’ve been thinking about making a vision board. Maybe that will be a good project that my daughter and I can work on together. She loves to cut and glue. Oh yeah, kids love to cut and glue, don’t they? But you know what? I often just skip the glue and tape it all down when it has come together. Letting every image find its place without worrying about getting it glued down makes it flow more for me. The images get to decide where they’re going, they lead. It’s a magical experience for me. Thanks, Eric. I loved this post and it was well done. I really enjoyed your photos, especially the last collage. I clicked to enlarge it and it’s fabulous. When I think of collages, I think more of spaces. My collage is located in my office. I have a mix of old and new furniture and lots of pictures that are special to me. It’s a comfortable place. Hi Sara – I can hear such a sense of self in those words – “it’s my space and my collage of me.” I think that’s so important. Stepping back to say, “This is me,” whether through collage or some other practice or metaphor, anchors us to our lives, helps us belong to ourselves. Very powerful indeed. Thanks for reminding me of that. And thanks for your words about the collage. That one was my “this is me” collage. Hi Patty! Oh my goodness but this touched me! I am SO going to make a collage when this last bunch of company leaves the lake house! I cannot WAIT! Great fastastic wonderful insightful and FUN! Thanks so much for this inspiration – you’re the best!!!! Thank you suZen! I appreciate your excitement and enthusiasm. It sounds like the timing will be perfect for it when your company goes and you get a little breathing room. I wish I could be there to see it. Hugs! Hi Tony – I always have an affinity for deep diggers, so I feel a kindred spirit with you, my friend. You’re so right that a life collage is a work in progress. Just like the actual “this is me” collage that I did, we can take that snapshot in time of our inner landscape, but the next minute, hour, day, it will have changed. That’s one of the things that fascinates me about life. Thanks for those wonderful thoughts, Tony. When I was around 30, I used to make collages for my friends, that were supposed to represent how i saw them. Then, after not making them for years, the summer after my divorce (2001) I briefly made them again, and turned out three. One had a the theme of getting away, and had lots of white sand beaches and inviting places. The other two depicted how i wanted to become, myself. I still have the travel one and one of the others. Sounds like they have a great deal of meaning for you, Shay. Thanks for sharing that, because it shows what a deep process this can be. And I’m really resonating with you about the collages you made during that time of tremendous transition. I did something similar ten years ago, when I finished grad school. 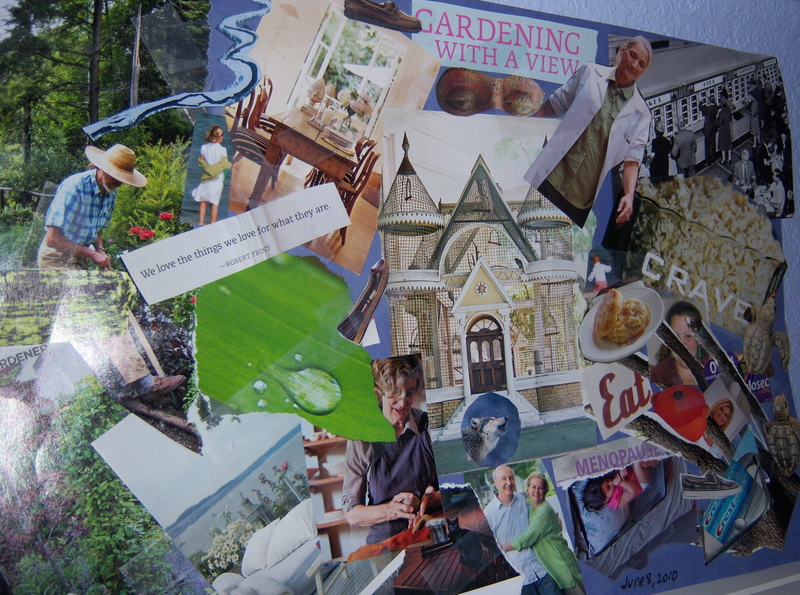 The first collage was all about retreating, resting – lots of water, blue and green colors. Then a year later, I did another, more about who I was becoming. Much more movement, a bit edgier, brighter colors. They showed me things about myself that I hadn’t quite realized. Hi Patty — I definitely resonated with what you said about sitting with the questions being more important than finding an answer. I had a very powerful experience on Saturday with a group of men where they told me they could not feel what I was committed to, as much as I protested that I had a commitment. But eventually, I had to admit that, in that moment, I was not committed to anything, and then reality broke open and possibility existed again. You illustrate it perfectly with your story, Chris. Thanks so much for sharing that moment. Thanks for these suggestions! I did a vision map recently, but kind of skipped the afterwards part, of reflection and self-questioning. Just kind of thought: well, that is perty! And moved on. I think I’ll dig it up and try writing those sentences. Hi Madeleine! Welcome. Such a treat to see you here. You’re so right: one level is taking in the collage’s beauty, which is wonderful. But going deeper with it really anchors its meaning. So go for it! Hi Sibyl – Yes, it’s a very fun and meaningful way to learn about ourselves, especially the deeper, intuitive side. Thanks for your kind comments! That’s cool. I guess I should make one for myself too! I love colourful collages actually. I don’t mind what I put up, but I just want them to be attractive to myself. Hi Jaky – Welcome, and thanks for stopping by my blog. Absolutely do one for yourself. No matter what images you feel pulled towards, you will find beauty in them. Holy Cats! I have re-read this post a couple of times and you are peeking into my own soul. Sometimes we don’t appreciate or even see the best parts of ourselves. Much of the self development touted today is peering into a future we are told to create, but can’t really see. Starting with understanding our own beautiful gifts and talents is a lovely and sensible place to begin. Oh, you know I like that Erin, that you feel I’ve peeked into your soul. Thank you so much for that.